The best way to get to know a community is by scheduling a tour. See the facilities, meet the staff and residents, and get a feel first hand what it's like to live at Parc at Traditions Assisted Living. Imagine waking each morning to friendly faces and graceful surroundings. Imagine an appealing selection of thoughtfully-appointed apartment homes, conveniently located in the heart of the Traditions Club community. Imagine fine dining and freshly-cut flowers. Imagine uncompromising service and dedicated care. Imagine an engaging lifestyle of stylish comfort. Thoughtfully crafted and tastefully appointed, Parc at Traditions combines the services and features of resort-style living with the relaxed atmosphere of traditional warmth, genuine friendship and comfort of home. Designed with comfort and convenience in mind, Parc at Traditions’ apartment homes are welcoming and stylish. Spacious, well-appointed studio, one- and two-bedroom floor plans are available to fit your lifestyle. Friendship is celebrated around the dinner table, which is why Parc at Traditions’ elegant dining room is a happy focus of community life. Here we have captured the essence of fine dining with a full-service, white tablecloth experience that features the Executive Chef’s finest selections. Parc’s extensive always-available menu is complemented by daily lunch and dinner specials, expertly prepared and served by our accommodating staff. Residents may savor a delicious continental breakfast each morning, along with their choice of lunch or dinner offerings ranging from comfort food favorites to haute cuisine. In addition, Parc at Traditions’ inviting bistro affords a less formal presentation of fresh selections for times when convenience is a priority. Residents may also enjoy demonstrations at the Executive Chef’s display kitchen and community table, or al fresco dining overlooking our beautiful wooded setting. Parc at Traditions’ knowledgeable staff is available to plan a menu or event for residents who wish to host a special occasion with family or friends. And if you have need of dining alternatives, our menus feature a variety of healthful options from which to choose. Below is a sample of a Parc Communities menu. Tasting is believing, so please accept our invitation to visit and dine with us at Parc at Traditions. 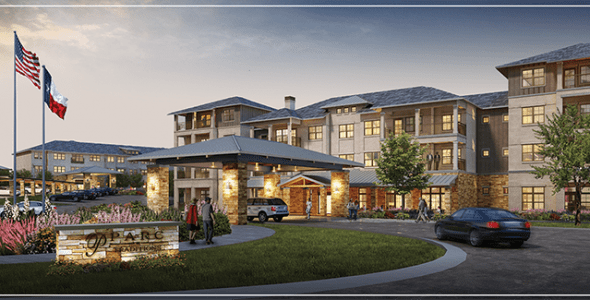 Parc at Traditions inspires residents to live healthy, active lifestyles through engaging programs that promote health, wellness, activity, and independence. Our innovative programs are built upon four fundamental “pillars” of wellness: Physical, Social, Intellectual and Spiritual. Each program element is specifically designed to engage one or more of these four pillars and provide residents the opportunity to enjoy vibrant, engaged and enriched lives.